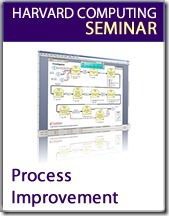 Understand the purpose of Business Process Improvement (BPI). Important to the organization, stakeholders and management. Know where and how to start your BPI project. Seems obvious, but there are often more opportunities to make a project very board, and be so ambitious that nothing will end up been achieved. Be able to facilitate your own BPI workshop. If you can’t get others on the same page to improve the process your project WILL fail. Running an improvement workshop is a key part of that success. Create the link between analysis and improvement and pilot the “to be” process. Analyzing the current process is a great starting point for the project. Connecting these dots to reach a future state is crucial. Learn how to roll out these changes to the organization. A lot of process improvement projects end up being shelved. Unless you gain agreement to roll out the changes the status quo may remain. Process Improvement (BPI) is a systematic approach to help any organization make significant changes in the way it does business. The organization may be a for-profit business, a non-profit organization, a government agency, or any other ongoing concern. Courtesy Harvard Computing Group, Inc.